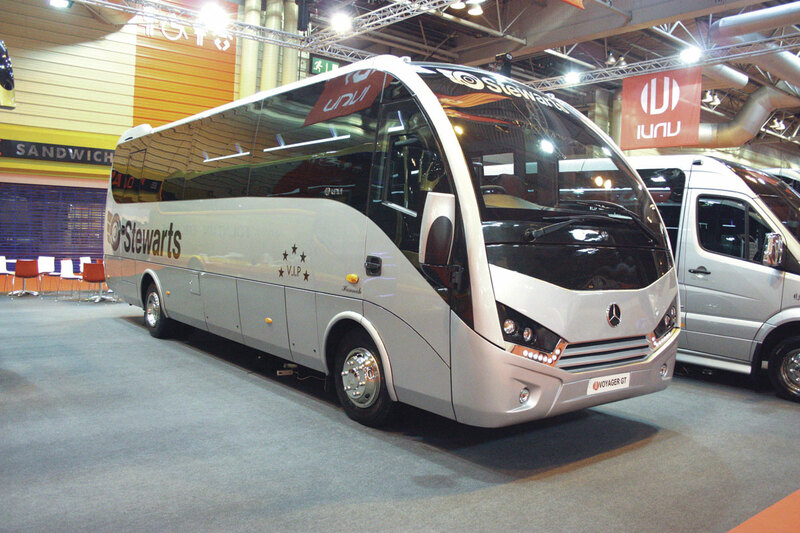 The new 9.5 tonne Cannon/Eurocoach Softline Variant can seat up to 33 passengers. 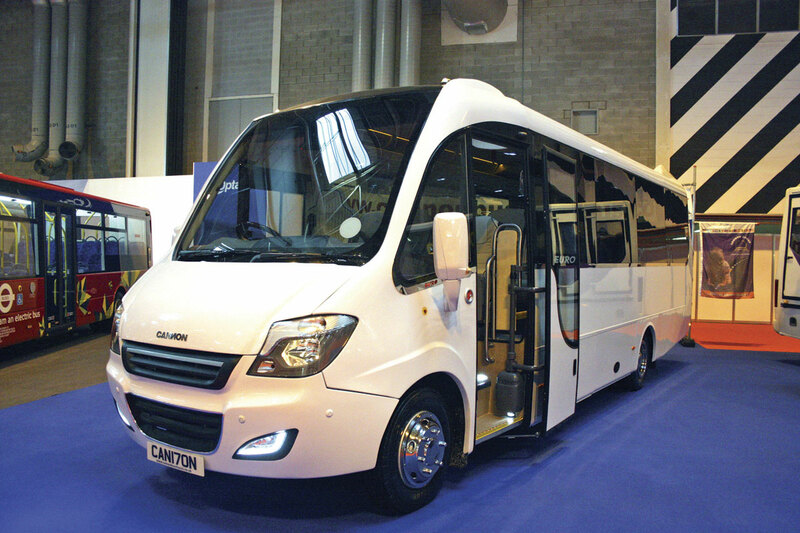 It is a new venture by Cannon of Northern Ireland and the former Euro Coachbuilders of Donegal, Ireland. The 12-tonne Atego mounted Plaxton Cheetah XL. EVM’s new Sprinter based Cabrio proved a real head turner and has already resulted in orders. A place to let your hair down. A limo bus based on a Sprinter produced by Starline of South Wales. Connaught were hoping to launch their new Iveco New Daily based Sunshine 29 seater but a delay meant they had to show this left hand drive version. 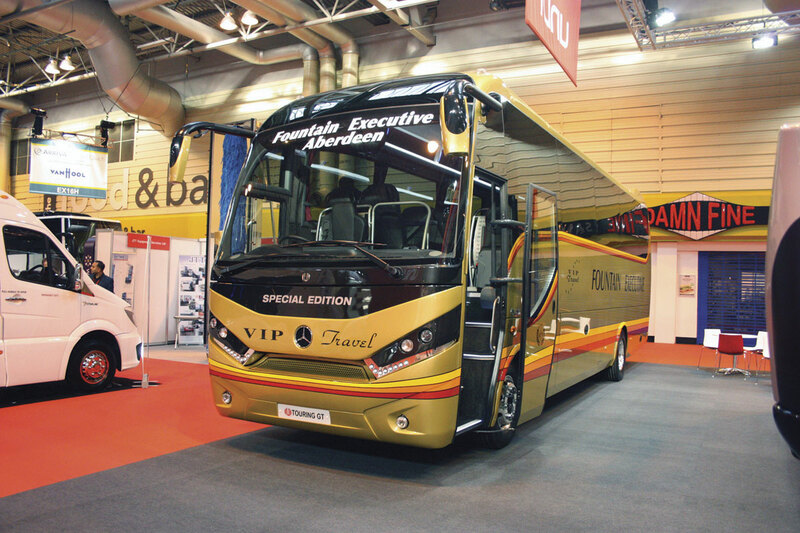 A luxurious EVM X’Clusive Sprinter built for Apollo Corporate Coaching. Mercedes-Benz is offering a 22-seat school bus version of the Sprinter Transfer that offers every safety feature they could think of. 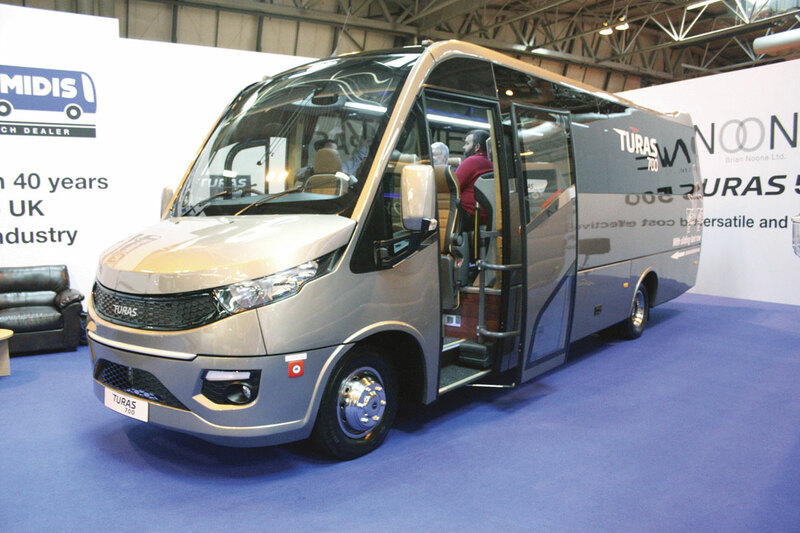 Turkish built Noone Turas 700 29 seater is built on the 7.5 tonne Iveco New Daily 70C17 chassis. Connaught’s Ferqui built F5 mid range contender is already proving popular. This example is for Bessway Travel. The long awaited Noone Turas 900 is built on a 9.5 tonne Mercedes-Benz Atego chassis with modified driving position. It can seat up to 33. 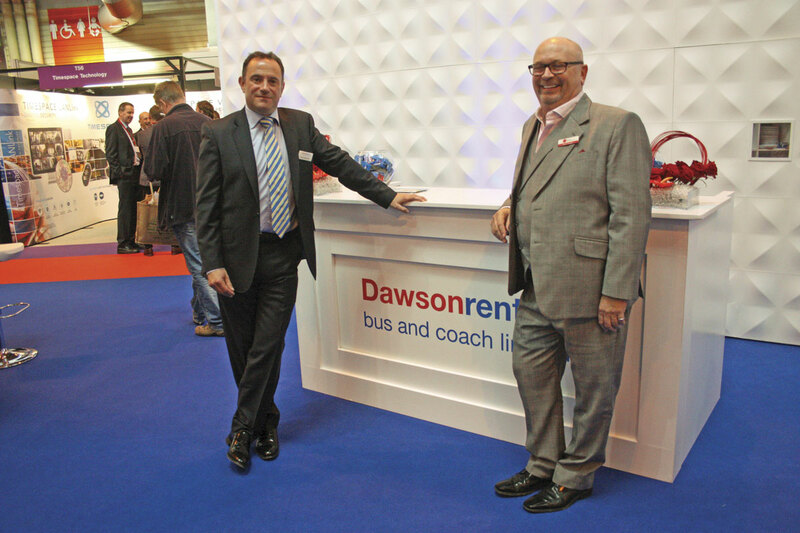 Paul Sainthouse (left) of Dawsonrentals concluded a deal with Treka Bus’s Mark Clissett for another 50 Treka 16 coachbuilt accessible Sprinters for delivery next year. The Unvi Voyager can seat up to 35. This 29 seat luxury version was built for Stewarts of Reading. Yutong TC9 for Abbots of Leeming. It has 32 seats, saloon toilet and servery. Euromotive of Kent built this 16 seat accessible VW Crafter. The new City Dash from Nu-Track. 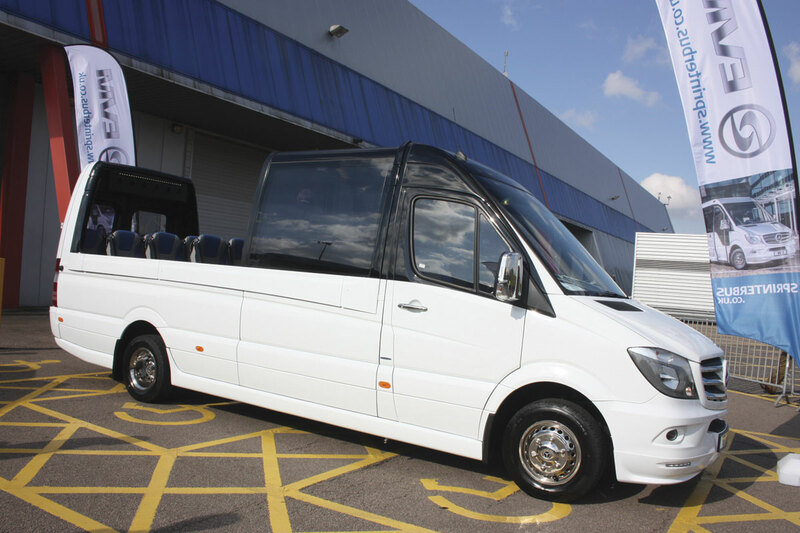 It is a flat floored directly wheelchair accessible 16 seat minibus. Mercedes-Benz Atego based Unvi Touring GT for Fountains Executive of Aberdeen. This 16 seat accessible VW Crafter CR50 was built by TBC Conversions of Northern Ireland. Mellor Orion flat floored directly wheelchair accessible service bus. It can carry up to 22 passengers. A year on and all the key players in that market have refined their ideas and brought their new models to the market place. There were also some completely new vehicles in the sector to liven things up. It was arguably the most vibrant sector at the Show. As anticipated the main player in the midi section from a chassis point of view has been the Mercedes-Benz front engine Atego range but it is interesting the spread of chassis gross weights that have been chosen by the various manufacturers. Some have opted to use the nine tonne version whilst others have gone for the 10 tonne, 12 tonne and even 15 tonne versions. Overall weight concerns, for so long the bugbear of the Vario in this class, now seem a thing of the past. We are also beginning to see another sub-class appearing centred around the 27 to 29 seat sector using the excellent 7.5 tonne capacity Iveco 70C17 New Daily chassis. With the imminent arrival into this model of the new Hi-Light eight-speed automatic transmission look to see this sector grow. I was struck by how upbeat everyone was, reporting good levels of business for the new models and anticipating even better sales next year. The same story was true of the minibus/coach builders and the accessible vehicle builders and converters. 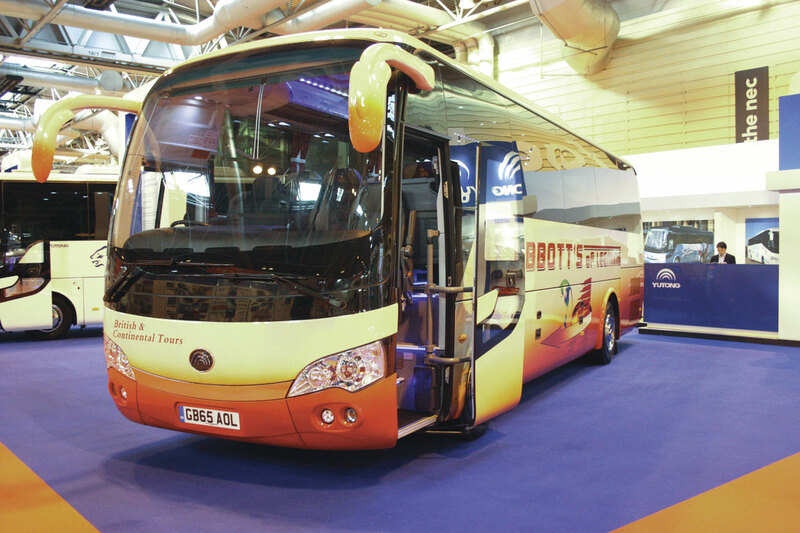 One new vehicle which did not make last year’s Show was Plaxton’s new Cheetah but it was there this time with examples on the ADL and Dawsonrentals stands. The jury is still out on how the vehicles look. Most people I spoke to admitted to being rather disappointed by the styling saying it lacked flair, one even likened it to a furniture van. Unvi had tweaked the styling of their new Voyager and whilst it may not be everyone’s cup of tea in that particular department it is a great deal more acceptable and those that have them speak highly of them. Still think it is a shame that we have two different vehicles on the market with the same Voyager name, the other being the New Daily mounted Sitcar. I know they are in slightly different categories but it is still confusing. A new player in the market that has made rapid strides in the year is Yutong with the TC9 midi. Imported by Pelican Engineering, TC9s seem to be popping up all over the place – even my local operator Alba Travel have one (and another on the way) and are reporting good things about it. There were a couple of completely new vehicles at the show and as ever EVM had a head turner that pushed the boundaries forward. 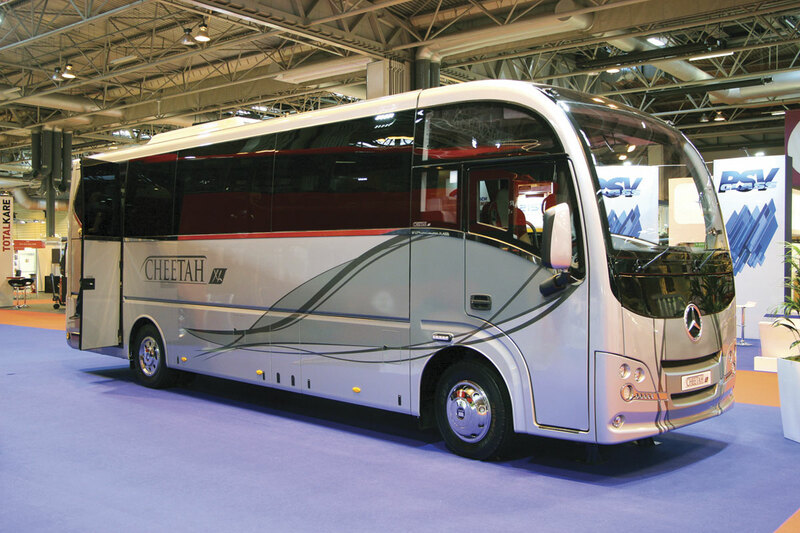 Cannon and Eurocoach had come together at the show to introduce the new Softline Variant a 9.5 tonne gross up to 33-seat minicoach. Technically the Softline Variant is not new because William Cannon has been beavering away up in Strabane, Northern Ireland developing the chassis/cowl for a couple of years although in the form it was shown this time it was considerably different. The basis is a 6mm channel section, steel ladder frame with Albion axles, air suspension at the rear, power steering and disc brakes all round and a Telma retarder. The chassis is powered by a front mounted Cummins Euro6 diesel developing either 180bhp (135kW) or 210bhp (157kW) and impressive torque figures of 700 and 760Nm respectively. The engine is matched with either a ZF six-speed manual transmission or alternatively a ZF AS-Tronic automated transmission. Where the new Softline Variant really differs is in the package because it is now being offered with a stylish body developed off the back of the well renowned Vee bodied Varios which used to be the mainstay of production at Euro Coachbuilders the one time Donegal, Republic of Ireland coachbuilders. The new body has been developed by the former doyen of Euro Coachbuilders Joe Ferrie and his sons Stephen and Neill. It maintains the strength of the old Vee body but this has been upgraded in specification terms and now meets all the required European standards and is hot dip galvanised for corrosion protection. Other features of the new body are the powered entrance door, seating for up to 33, panoramic bonded glazing, Eberspächer convection heating and air conditioning option, large boot and additional underfloor side lockers. The coach has a wheelbase of 4.815m and an overall length of 8.74m. Talks are going on with authorities in both Northern Ireland and the Republic with the aim of setting up a chassis manufacturing facility in Strabane and opening up a new body facility in Donegal for production of the vehicle. 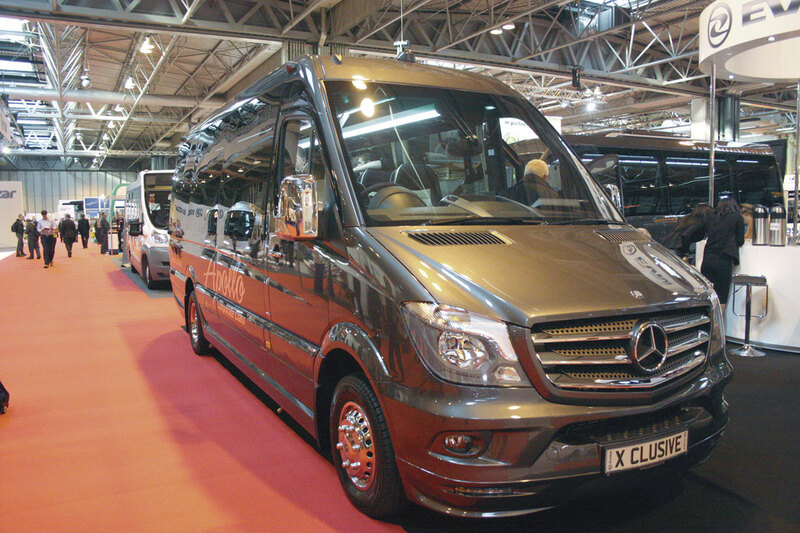 Specialists in minibuses and coaches developed off the back of the Mercedes-Benz Sprinter range of vans and chassis, EVM launched two new models at the show as well as revised versions of many of their other models. New was the eight-seat super luxury X’Clusive model which my colleague Kirsty Flatt described in detail in last week’s issue (No 1346). Not surprisingly it created a lot of attention even though EVM chose to display it in the outside area. 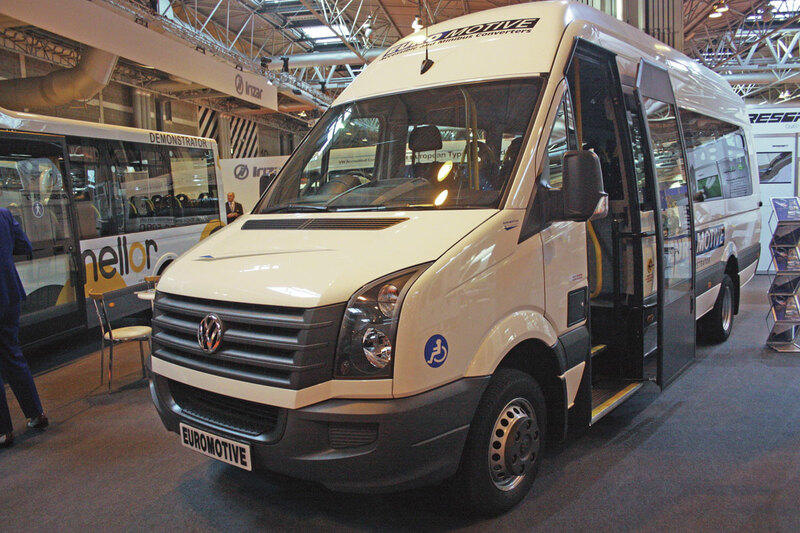 Smaller exclusive Sprinter vehicles which can be driven without a PCV licence is a market EVM has been developing steadily in recent years. However, the new EVM minicoach that really set the heads turning was the EVM Cabrio, a long five tonne Sprinter which has virtually a completely glazed upper body. Not only does this provide passengers with an unrivalled panoramic view, at the touch of a switch the driver can telescope two sections of the body into the third and turn the vehicle into a giant cabriolet! It is an idea that EVM have been working on for some time and which the skilled crew at their Kilbeggan factory in Ireland have now successfully completed. 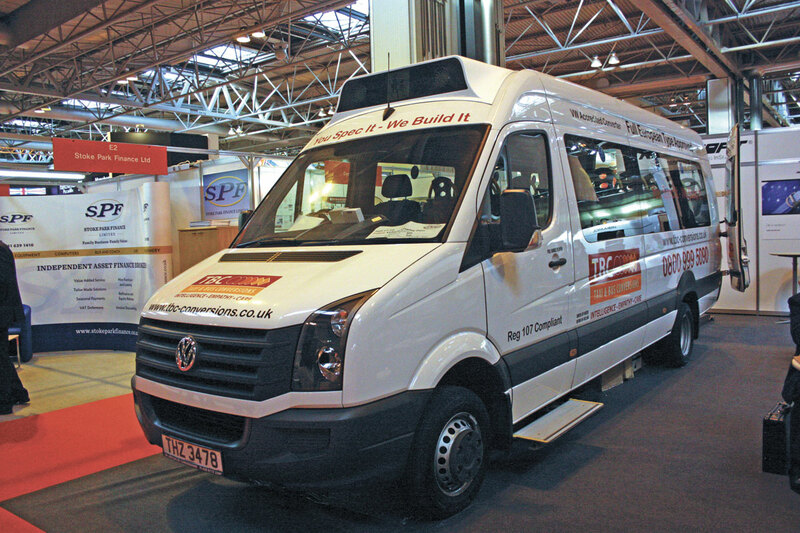 On their stand EVM showed four examples of their varied Sprinter based vehicles. These were a coachbuilt Grand Tourer to executive specification with 19 seats, a 19-seat Avantgarde with a large boot and a luxuriously specified X’Clusive with seating for 17, some set at tables, which had been built for Apollo Coaches to their Corporate Class. The fourth exhibit was another example of their diversified range being one of their new breed of low floor directly wheelchair accessible Sprinters. EVM have supplied a number of these this year to community transport groups and also car parking operations. A variation on the one on show from others I have seen and driven was that it was fitted with a two piece outward opening Masats door instead of the single piece Tamware unit. Apparently the twin door arrangement is more popular with car parking operations. Steve Peach was one of the first to get his new mid-range contender the F5 to the market and an excellent contender it is. It uses the 12 tonne Mercedes-Benz Atego chassis and can provide seating accommodation in the 34 to 38-seat range. 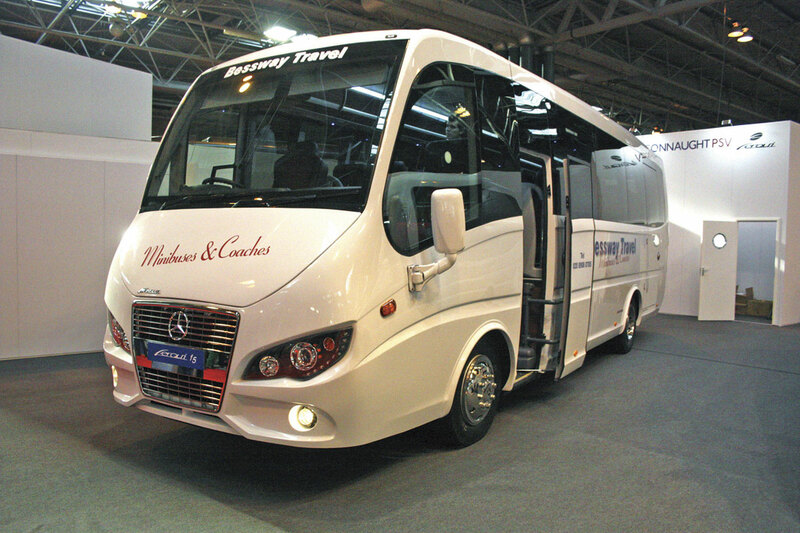 The vehicle on show was a 35 seater with automated transmission for Bessway Travel. Steve had hoped to show the first of his new mid-range contenders the Sunshine but production was delayed so Steve showed the left hand drive prototype on which the new model is based. It utilises the excellent Iveco 70C17 New Daily chassis and will typically provide around 29 seats and good luggage capacity. The first UK example is due to arrive in days. Along with the F5 and the Sunshine, Steve also showed examples of the Soroco Sprinter which can be built with 16 or 19 seats and good boot sizes or alternatively as a 22 seater with a small boot. Steve expressed himself pleased with the progress they had made over the last year. Unvi is another manufacturer pleased with the progress being made especially now that the new Voyager mid-range contender is into full production. The company had two examples on show. One was a 29-seat plus courier version fitted with manual transmission and a luxury trimmed 33 seat plus courier version with automatic transmission. The latter example was destined for the fleet of Stewart’s of Reading. Representing the range of Sprinter conversions on offer was a 516 automatic Sprinter Vega EXT with 19 seats and a good sized boot. Representing the largest models in the range were a Touring GT and a Touring GTR. The GT which uses the 1524 Mercedes-Benz Atego chassis was fitted with just 25 leather trimmed seats with most set at tables, a rear saloon toilet and servery unit. It was destined for Fountains Executive of Aberdeenshire and featured a bright metallic paint scheme. The continental door is mounted just ahead of the servery at the offside rear. The Touring GTR which uses a rear engined MAN chassis with ZF automatic transmission has a conventional coach front entrance arrangement. It was fitted with 39 leather trimmed Brusa C120 Top Flair seats, rear saloon toilet and servery and was destined for Panache Travel. I said earlier that Yutong had made significant ground in the last twelve months particularly with the mid-range TC9 model which features a Cummins 280bhp rear engine matched to ZF automatic transmission. There are now 35 TC9s on the road in the UK with four of the latest batch of ten ordered also sold. A further 30 are on order. They showed two TC9s. One was in the instantly recognisable livery of Abbots of Leeming in North Yorkshire and had seating for 32 plus an offside rear saloon toilet and AD servery replacing the rear middle seat. The seats had been trimmed by Eastgate in the UK using E-Leather and incorporated the Abbott’s logo on the headrest front and no smoking and seatbelt reminder on the rear. The high standard of external painting and lettering had been achieved at the Yutong plant. The second TC9 was for Hunters of Northants and seated 35 in leather seats supplied from the factory, complete with a USB charging point on the rear of every seat. The toilet option adds £5,500 to the standard price of £140,000 and factory supplied leather seats add a further £3,500. At the last Show, Noone of Ireland and its UK distributor Alan White’s Minis to Midis presented perhaps the most radical of the new designs for replacing the Mercedes-Benz Vario, the Turas 900. This took the 9.5 tonne Mercedes-Benz Atego chassis and then re-positioned the steering system to allow the engine to be kept out of the saloon, thus enabling the doorway to be under the driver’s view. Fine tuning the design has taken Noone’s Portuguese builder some time to resolve but at last product is beginning to come through. Just as the prototype caused quite a stir at the last show for its radicalism so did the production versions, but there is no doubt that it is an interesting approach to the problem. It can seat up to 33 passengers and also has a good sized, easy to use boot. Noone had two examples on show. One had 29 seats and a saloon toilet and was on an Atego with automatic transmission. It was one of six being provided to Bernard Kavanagh of Urlingford, one of the Republic’s major coach operators. Irish vehicles have slightly different dimensions to suit their complicated VAT rules. The other example was luxuriously trimmed in black leather with 27 seats, some set at tables, and was destined for the fleet of Whites of St. Albans. Noone is another manufacturer using the 7.5tonne Iveco 70C17 New Daily chassis to slot between the Sprinter based Turas 500 and the Atego based Turas 900. This produces the Turas 700 which is built in Turkey. It provides seating in the 27 to 29 seat range and a good sized boot. Boot capacity can be increased by sliding the rear row of seats forward. The Turas 500 range uses the five tonne Mercedes-Benz Sprinter and versions are produced with a coachbuilt body and as van conversions (500C). The range offers a variety of seating capacities typically 16, 19 or 22 with varying degrees of boot space. On show Noone had a Turas 500C Envoy model on an extended Sprinter with 16 seats, two tables and a good sized boot and they also showed a very well presented Turas 500 coachbuilt example with 16 seats, four tables and again a useful boot space. 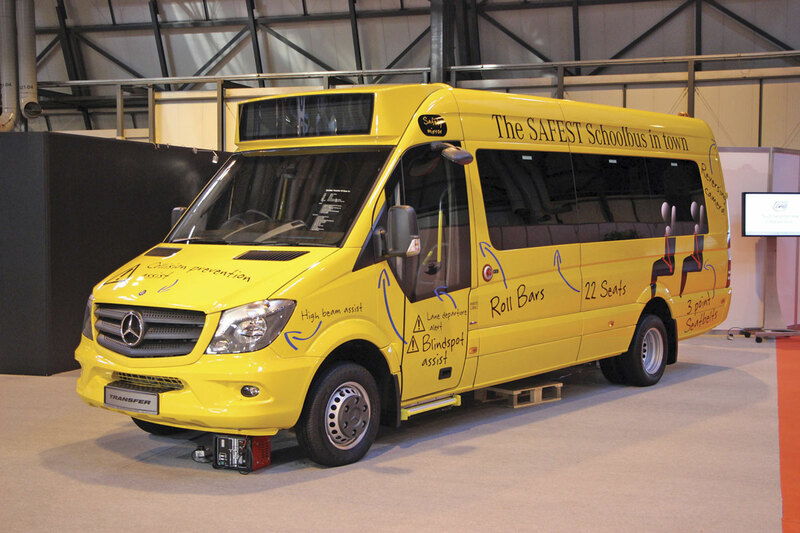 The only Mercedes-Benz shown by Evobus UK inside the hall was a five-tonne Sprinter Transfer school bus equipped with 22 seats. It had every safety measure on it they could find. The 12-tonne Atego mounted Cheetah has effectively moved the model from the minicoach to the midicoach sector as it now offers up to 36 seats. On display was a Cheetah XL in a silver demonstration livery. It can be offered with two different engine capacities, a choice of either 177hp or 236hp versions of the Mercedes-Benz OM934 four-cylinder engine which is matched to the Powershift automated transmission. Alan Atkinson revealed that the company is on target to build 72 Cheetahs at Scarborough this year. Also with only one vehicle in the hall, but additional exhibits outside, was King Long. The baby of the King Long range in the UK, the XMQ6900 is 9.0m long and has a 4.3m wheelbase, Cummins engine and ZF transmission. It was shown in the colours of regular King Long customer, Hunters. A 15 seat Peugeot Boxer based minibus conversion from Red Kite formed the backdrop to Cogent’s stand. The Sportlight is particularly aimed at the school market and can be driven on a car licence. Seating options from nine to 17 are offered using Cogent seats and mountings which were shown in accompanying graphics being tested at Millbrook. For something completely different all you had to do was go to the Starline stand where you would find two Sprinters converted by the South Wales company into limousines with luxurious seating, mood lighting, sound systems and a real touch of luxury. Quite a haven from the hub-bub of the Show! I bumped into an operator’s young son on another stand and he was still talking about it – obviously it was his star of the show. As usual at this show seating manufacturer Rescroft acted as hosts to a raft of accessible vehicle builders. 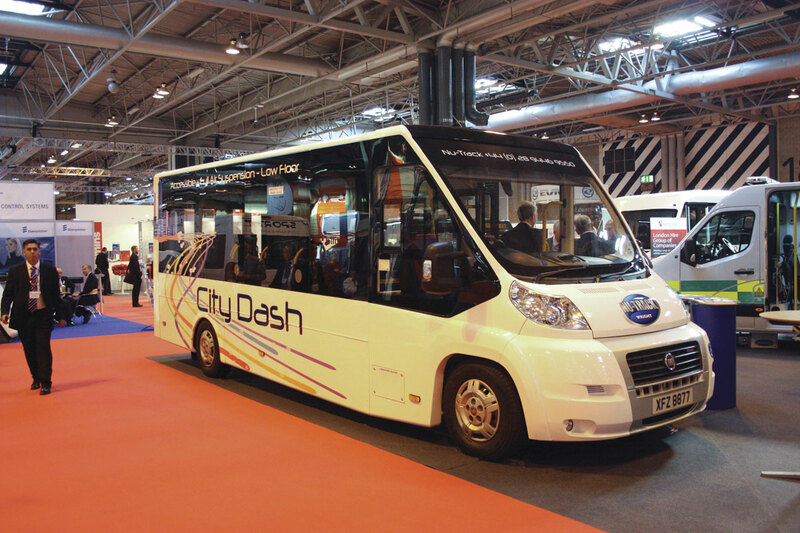 The stand out exhibit came from Nu-Track, part of the Wright Group, who launched their new City Dash directly wheelchair accessible flat floored minibus. It combines the Fiat Ducato Maxi front end with an AL-KO ultra-low frame with air suspension at the rear. It is designed to allow wheelchairs direct access from the side via a large powered door or through the rear via a fold out ramp. 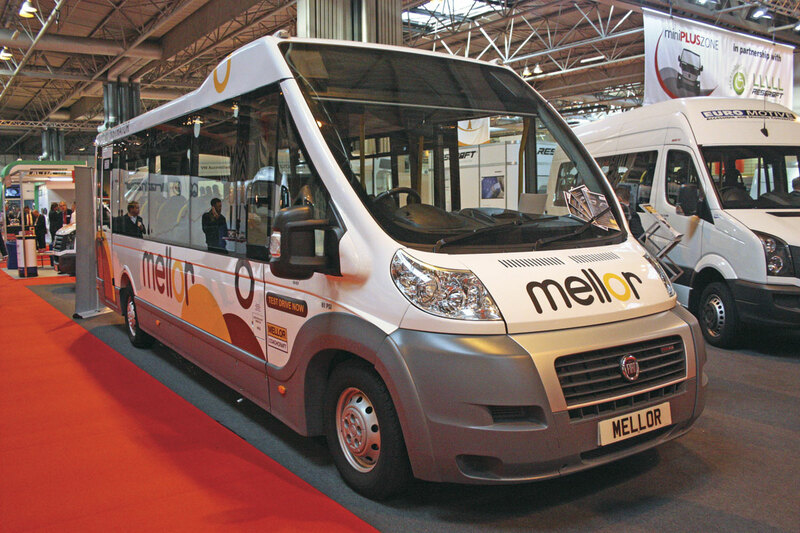 It is a clear competitor to the established sector leader, Mellor’s Orion. I was impressed with the clean lines of the vehicle and the high standard of both the external fibre-glass cladding and the internal fitting out. Visitors were able to compare directly the Nu-Track and Mellor low floor directly wheelchair accessible minibuses because Mellor showed an Orion in service bus form. Mellor have been having considerable success with the service bus version of the Orion. This has the wheelchair bay in the conventional service bus position behind the driver facing rearward. It has a maximum seating capacity of 22 when not carrying a wheelchair passenger. 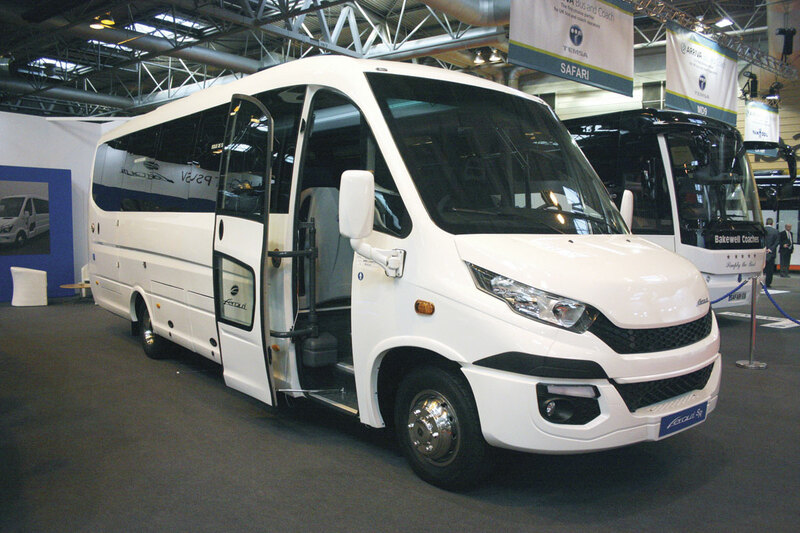 I asked Alison Prince, Mellor’s head of sales whether there had been any progress on re-starting production of the smaller directly wheelchair accessible minibus the Tucana. The Tucana uses the VW T5 front end but the T5 is now out of production. It should have been replaced by now by the new T6 but production seems to have been delayed. Perhaps VW have more important things on their minds at the moment! Treka Bus continues to go from strength to strength with its Mercedes-Benz Sprinter five tonner based Treka 16 accessible minibuses. They produce both coachbuilt and van conversion models. 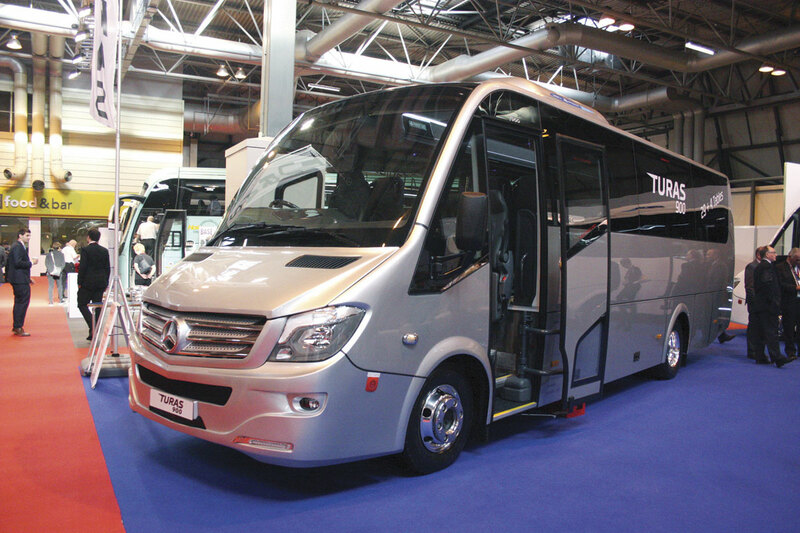 In recent weeks they have secured major contracts from London Hire for both coachbuilt and van conversion models, the City of Leeds again for both coachbuilt and van conversion models and at the show Treka Bus owner Mark Clissett concluded an agreement with long standing customer Paul Sainthouse of Dawsonrentals to supply a further 50 coachbuilt Treka 16s during 2016. Treka Bus have recently expanded their in-house fibre-glass manufacturing centre to cope with increasing demand. This facility is run as a separate company to Treka Bus. They are also planning to increase production at the bus factory in Brighouse to seven vehicles a week from January. The vehicle on show was to London Hire’s standard specification with 16 Rescroft CT-Space seats, Eberspächer heating and air conditioning, bonded glazing, CCTV camera system, PLS Door Safe, a PLS rear underfloor cassette style tail lift, fold out additional entrance step and power door. The vehicle was trimmed in an attractive new moquette especially designed for London Hire using their house colours of grey and red. London Hire have been extending their national coverage steadily with new bases at Milton Keynes, Rotherham and shortly in Portsmouth. TBC from Northern Ireland showed a VW Crafter CR50 accessible minibus. It was fitted with 16 Rescroft CT-Lite seats or can carry up to six wheelchairs. The design features cab door entry with an extra step, bonded glazing and at the rear a Braun in-board tail lift. New Crafters are becoming something of a rarity as production of the current models wind down ahead of the introduction of a new Crafter promised for early in the New Year. The new model Crafter will see production of the range move to VW’s Polish factory where the Lion’s City bus range was previously built. GM from Newton Abbot have built up a sound business producing quality, lightweight accessible minibuses particularly for school work, generally utilising Peugeot Boxer van bases. On show they had a Boxer with seating for 13 or alternatively five seated and two wheelchairs. The vehicle had GM’s excellent fold out entrance step arrangement with handrails and it was fitted with a rear mounted Braun in-board tail lift. The Kent accessible vehicle builders showed a VW Crafter CR50 with power door, Rescroft seats and a rear mounted PLS cassette style, underfloor tail lift. The vehicle had seats for 16 passengers or can carry one seated passenger and up to six wheelchairs. The vehicle also had bonded glazing, a flat floor, climate controlled heating and ventilation system and a reversing camera. Finish was to the usual high standard that typifies this small manufacturer. There were plenty of interesting new vehicles at Coach and Bus Live and after the turmoil of last year with all the uncertainty following the demise of the Vario it was nice to see the new contenders move from prototypes to productionised examples and the inevitable tweaks made to the designs. Has the market ever had so much choice?